We invest in preventing, minimising and recovering the waste generated, not only through our activities, but also by raising the awareness of our consumers. We believe in the positive impact of encouraging our employees and surrounding communities to use practices that prevent and minimise waste as well as to correctly separate waste, – to help save natural resources. We endeavour to recycle the waste we produce. In 2018, we recycled more than 85% of the waste we produced. In all, we produced 479,328 thousand tonnes of waste, 4.6% more than the previous year. This increase is due to the Group’s growing operations. We are commited to reduce the amount of waste sent to landfill by 5 percentage points in the 2018-2020 triennium. As food experts, we are determined to fight against food waste on all fronts. That’s why we are committed to reducing 50% of the food waste produced by our operations by 2025, as part of the Consumer Goods Forum, with 2016 as the base year. In 2018, the Group’s activities generated 15.9 kg of food waste per tonne of food sold, an increase of about 10% over 2017 and of about 20% over 2016 (reference year), which is explained by an increase in shrinkage in the Fruit & Vegetables and Bakery categories. The fruit and vegetables commonly called “ugly” are thus incorporated into the soups we make in Portugal and Poland or are transformed into fourth-range products, ie ready-to-use convenience foodstuffs from cut and washed vegetables. These “ugly” products are also sold, in their original form, at a reduced price in the Recheio stores. This is how, in 2018, we ensured the introduction into the value chain of 13,600 tonnes of these “ugly” products, which represents an increase of over 2.8% over 2017. In addition, our operations at Jerónimo Martins Agro-Alimentar buy by-products from the food industry and uncalibrated vegetables to be incorporated into cattle feed. In 2018, more than 3,000 tonnes of these materials were incorporated into the animals’ diet. Still within the scope of the fight against food waste, we are commited to facilitating consumers with the management of the expiry dates of food products in all countries, by adopting, whenever possible and according to the law, of only one expiration date on product labels. Get to know the Group’s food waste indicators. It is our aim to promote more sustainable supply chains and consumption practices through in-depth knowledge of the origins and methods of producing material resources we consume, such as paper and plastic. The projects we develop not only encourage the use of paper from sustainably managed forests when absolutely necessary, but also to effectively reduce paper usage. In Poland, the paper used at our offices is produced by environmentally certified companies or by those which, at least, have a certified environmental management system. In Colombia, the paper used is manufactured using sugar cane. In Portugal, our paper is a “European Ecolabel” product. The paper used in Portugal for printing the banners’ magazines is PEFC (Programme for the Endorsement of Forest Certification) or FSC (Forest Stewardship Council) certified and/or the companies producing it have ISO 14001 certification. The paper used for the Pingo Doce and Recheio leaflets and catalogues is also a “European Ecolabel” product or FSC or PEFC certified. The same goes for the leaflets we print in Poland. In 2018, there was an increase in consumption cardboard packaging for Private Brand liquid products and office paper. In the first case, the increase is essentially due to the usage of this material instead of others, such as plastic or glass. Office paper, responsible for less than 1% of the total material used, slightly increased in all our operations, especially in Colombia. However, with the decrease in the amount of promotional leaflets –boosted by Biedronka, which reduced their size in 2018 – the global consumption of paper in the Group decreased. See in detail the Group's main materials consumption indicators. Since 2011, Pingo Doce has already saved more than 15,000 tonnes of materials in the packaging of Private Brand products. Having an effective sustainability strategy implies changing internal practices, as well as encouraging our suppliers to use more responsible processes. optimise the costs of production, transport and management of packaging waste. Since the project began in 2010, over 20,000 tonnes of materials have been spared and the emission of 3,400 tonnes of CO2 on transport has been avoided. With this, we improved the eco-efficiency of the packaging of more than 311 Private Brand product references. For the 2018-2020 period, we aim to implement together with our partners, at least 20 projects of this nature every year. At the Jerónimo Martins Group, we charge for the plastic bags provided at our checkout counters of all our Companies, thus encouraging our customers to use less plastic bags. This initiative has been gradually introduced since 2007. In Portugal, we use reusable plastic crates in the Perishable and Dairy sections and, in Poland, we use reusable plastic crates to pack and transport small electronic equipment. In Colombia, we have reusable shipping crates for bottled water and fresh fruit and vegetables. In all, we avoided using nearly 32 thousand tonnes of single-use packaging. In 2018, Pingo Doce has established a partnership for the launch of an innovative water bottle refill solution. This service is provided through a piped water dispenser with a purifying filter. The project was implemented in 42 stores in 2018 and is expected to reach 100 stores by the end of 2019. This solution made it possible to avoid the consumption of 3,800 kg of disposable plastic packaging in Portugal. 98% of the Biedronka store network had recycling bins for the collection of small electrical appliances, fluorescent lamps and batteries. 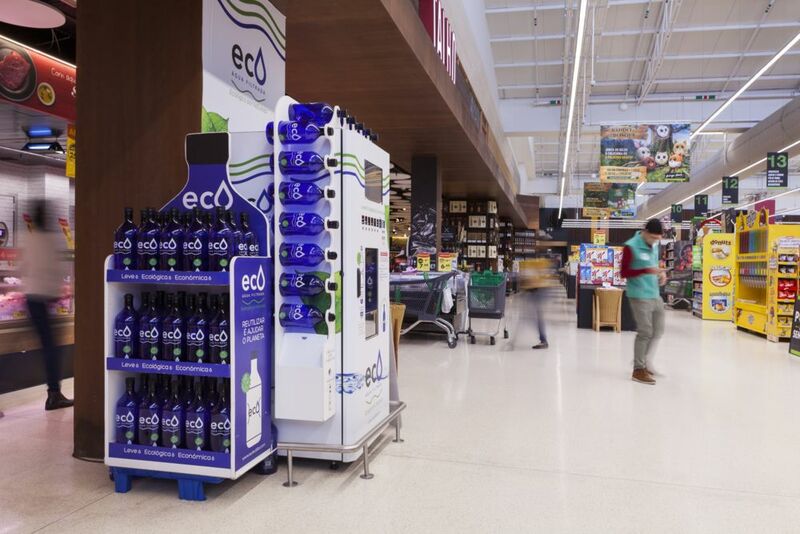 88% of the Pingo Doce store network has at least one type of recycling bin to collect waste. Either batteries, lamps and light bulbs, used cooking oil or coffee capsules can be deposited in a recycling bin, among others. The recycling of coffee capsules and lids/corks/bottle tops led to a donation of more than 3,500 euros to charities. At Ara, the project to collect used batteries from Colombian have been placed in 250 stores (47% of the store network). In 2018, our customers deposited more than 575 tonnes of waste across the Group’s stores. The data referring to waste’s type and disposal, food waste and Ecodesign projects was verified by an external and independent auditor within the scope of the Group’s 2018 Annual Report. Group’s food waste indicators for 2016. Group’s food waste indicators for 2017. Group’s food waste indicators for 2018. Indicators about waste dropped-off by customers in recycling bins at stores and types of recycling bins.